Hey guys, so if you're not aware by now (where have you been if not) I visited Sydney for five weeks back in November. I was there for five weeks and it was honestly one of the best holidays I have ever had. I was actually so sad to leave as I had such a good time. It was literally like a second home to me during my time there and I just had the best experiences. Coming back home to reality wasn't fun I can tell you that. But anyway, enough of that. Today I thought that I'd reminisce on a major bucket list experience of when I climbed, yes CLIMBED, the Sydney Harbor Bridge. I never ever thought I'd be saying those words. I thought that today I would talk you through my experience which will include everything from the booking process to the end of the climb. Enjoy! Even though I didn't do this I recommend booking before you head off on your trip to Sydney because then you know it's booked and ready to go and you basically have to do it. I'm not kidding when I say I am a little bit terrified of heights so I kept 'umming and arring' about whether or not to do it but with a push from my Dad, half brother & my mum who was back home I eventually caved. I ended up booking my bridge climb three days before I did it. I was online and had just been paid a few days before so I went online to the Official Bridge Climb website and had a look at the various packages they had. Bridge Climb offer three different types of climb; the bridge climb sampler, the normal bridge-climb or the climb that I did which is called The Bridge Climb Express. This climb takes 2 and a half hours and doesn't include as many stops as the normal bridge climb which means you get to the top quicker. Even though it's a once in a life time experience my fear of heights made me want it to be over and done with as quick as possible. When booking the climb it was around $300 dollars but when I went to check out I saw that they were offering a special photo package for $50 dollars extra so my experience literally only cost £350 dollars but I do think it's worth it for a once in a life time experience. One thing I noticed before the climb was how they kept telling us to eat. I got messages and emails before hand telling me to make sure that I had something to eat which I did. I hate heights though and I was super nervous and I can never normally eat when I am like that so I really did have to force myself but I definitely felt better for it in the end. It was then time to head off to the climb where I checked in and got my ticket and photo voucher (not everyone gets this as you have to pay extra like I did). Before the climb they get you to fill out a medical form (you have to be fit and healthy and not pregnant - if you're any of these things a doctors note has to be provided or you won't be allowed to climb - this is all on the website so if you go without checking or knowing these things do not expect a refund). They also get you to do a breathalyzer before hand to make sure you're sober enough to do the climb (it is very high and steep so it's super important for concentration levels obviously). Once all this is done it's time to get into the harnesses and the one piece they give you. Not the most fashionable by any means but comfy and extremely warm. You also get given a cap to commemorate the trip but I recommend picking this up at the end of your climb as it can get pretty windy and even though it's attached to the suit it's annoying just feeling it flap about behind you so just go up normally and when you come back at the end you can get one. You're also not allowed any belongings on the bridge incase they fall of so any watches, bags, phones, keys etc all have to be left behind. You are allowed to wear rings and glasses but they securely attach the glasses to your suit before you set off on your climb. Once everything is done and you are all geared up ready to go it's time to start the climb. During the climb you get told all different kinds of interesting facts about the bridge like when it was made, who built it, how long it took, people who have fallen off it, famous people who have climbed it etc and it really is really interesting. The express climb is literally a power walk through up the inside arch so we have to be careful as there are a lot of steps and it's all up, up and up and it does feel like it's never ending but I didn't get that tired and you do stop occasionally to have breaks or have a photo taken. The photo above was taken half way up the bridge and to the left of the photo behind me you can see Circular Quay which is way the train station is, where the liners pull into the harbor and where I caught the ferry on a daily basis back to where I was staying in Mosman. Finally! The moment we've all been waiting for. Reaching the top of the Sydney Harbor Bridge is such an emotional experience. Once you get up there and you look down and around you and see how far you have come and the stunning scenery it can get very emotional because it is a difficult climb. When you've got to the top the tour guide tells you all the things that can happen on the bridge. They have people proposing at the top of the bridge and there's even a little dance floor where people can have a little bit of a party as well. The tour leader asked my group if anyone had a birthday so she could embarrass someone but nobody did. Is it bad I was a little bit disappointed at that? After this was done we had individual photos taken looking over at the opera house and then also had a group photo taken so we could remember who we climbed the bridge with which I did think was cute. After the photos were done it was time to make our way down which I personally found scarier than the way up as you really do see how high you are on the way down but I made it and then it was time to just strip out of our gear and collect the photos and then we were done. The bridge climb is not easy. You do have to be fit and healthy to do it and even though from down below it might look like a breeze it really isn't and can be tiring. I definitely stopped a couple of times on the way up. However, it is something I highly recommend. It is one of the best experiences of my life and if it wasn't so pricey I'd definitely consider doing it again but at different times to see what Sydney looks like different times of the day. I hope you enjoyed this post and if you are thinking of climbing the Sydney Harbour Bridge anytime soon this post has helped calm you down and relax you. 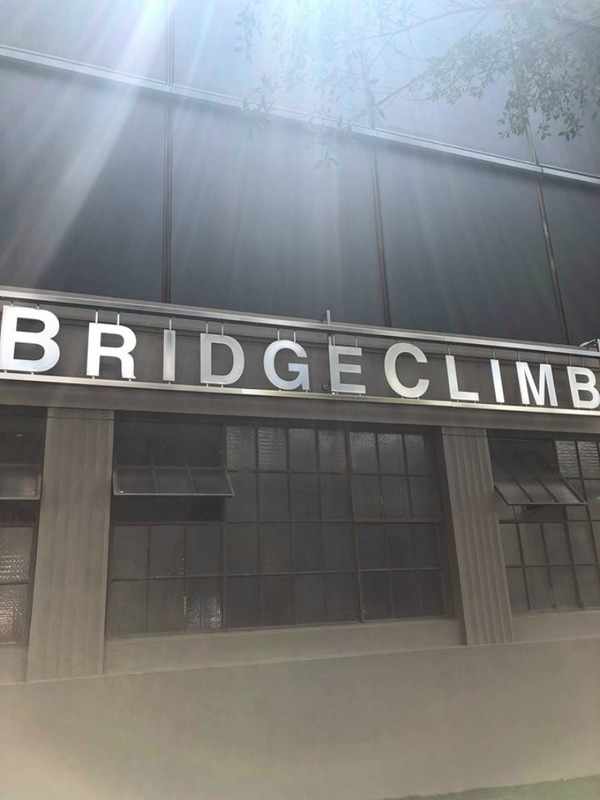 If you have already climbed the bridge be sure to let me know what you thought below as it is definitely something I'd love to talk to other people about as well as find out your experiences. Thank you for reading and I'll speak to you in my next post soon.